My sample stayed in the solution…or did it? Samples are precious. Well-prepared samples are the starting point of all successful experiments. That’s why we spend time and effort on sample preparation; so that the resulting samples are ready for downstream LC analyses. When we think of good sample prep and handling, we emphasize the sample purity, concentration, volume, etc. but often overlook the importance of sample recovery during storage. In fact, it is not uncommon for a perfectly well-prepared sample to be lost on the surface of a sample container while it is waiting for injection. What happened to my precious sample? Such unexpected binding to the surface is called Non-Specific Binding (NSB) or Non-Specific Adsorption (NSA). These terms originally came from ligand-binding assays, where an analyte is expected to be captured only through the specific interaction between the analyte and its receptors. All other bindings are referred to as non-specific. These days the terms NSB and NSA are used to describe any binding interactions that were not planned for and the consequent analyte loss. 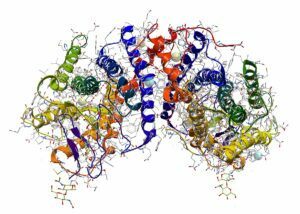 While NSB can happen with any molecule, it is most frequently observed with biomolecules such as proteins and peptides. This is because these biomolecules can form several chemically distinct regions. These regions may interact with an exposed surface through various attraction mechanisms, such as hydrophilic, hydrophobic, ionic, etc. This multitude of chemical interactions promotes NSB, and at the same time, effectively prevents their complete desorption (detachment from the surface). To make things worse, some complex biomolecules, such as folded proteins, can undergo a conformational change upon binding to the surface to further strengthen the adhesion. Such deformed proteins are consequently very difficult to detach from the surface, and you may never get them back! NSB can ruin a well-planned experiment. It can lead to inaccurate quantitative results, or even worse, you may not get any signal at all! How to avoid this sticky problem and is it effective? Principle 1 – Changing the chemical environment to eliminate or reduce the unwanted interactions. Because every analyte is chemically unique, there is no single condition that can be applied to all samples. In addition, changing the pH or adding an organic solvent may alter the properties of the biomolecule, such as its charge state or folded structure. Adding salt to the sample may promote ion suppression in MS detection. Principle 2 – Adding a blocking agent to cover up potential NSB sites on the surface. Adding a blocking agent is basically adding impurities back into the cleaned-up samples. Detergents and large polymers are particularly detrimental to LC-MS analyses because they may alter the column selectivity and increase the background. They are known to impact the MS ionization to induce severe ion suppression. Moreover, it is extremely difficult to remove them from the column and other system components. While it is quite effective, using a blocking agent may not be the best option for preparing LC-MS samples. Adding a carrier protein is a less problematic alternative to using detergents and polymers. It is a more favorable solution for LC-MS samples, but is nonetheless not the perfect solution. Proteins can show up as impurity peaks in chromatograms, see figure. One can avoid seeing impurity peaks by using a single mass monitoring or an SRM method to only monitor the target analytes, but those impurities can still impact your analysis behind the scene through ion suppression or enhancement. In full-scan analyses, they show up as extra peaks in MS spectra, complicating the interpretation. In addition, it is more difficult to handle solutions that contain a high concentration of proteins. Having both hydrophilic and hydrophobic regions, proteins in solution behave as surfactants. Protein solutions form froth, or bubbles, easily, and frothing during pipetting may lead to measurement errors. There are some cases where a blocking agent is necessary, but it is far more desirable if you can make samples without one. So far we thought about the problems of non-specific binding (NSB) and the pros and cons of common approaches to avoid NSB. In the next blog post, we will see how these limitation affects your sample prep workflow. Be on the lookout for our next blog post “Sample Preparation before LC-MS Quantification of Peptides and Proteins” by Kim Haynes.